Allen R. Maddox – Served in Company B of the Texas Rangers in 1896. Christian “Chris” Madsen (1851–1944) – A U.S. Deputy Marshal in Oklahoma Territory, Madsen worked closely with Heck Thomas and Bill Tilghman. Becoming known as the Three Guardsmen and were largely responsible for wiping out the lawlessness in Indian Territory. 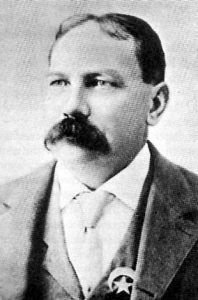 Barney Mason – A gunman and lawman, he was a deputy under Pat Garrett in Lincoln County, New Mexico. He killed John Farris in self-defense at Fort Sumner, New Mexico in 1880. Milt Mast – Sheriff of Nacogdoches County, Texas, who captured Wild Bill Longley on June 26, 1877. Edward J. Masterson, aka: Little Ed (1852–1878) – Brother of Bat Masterson and Dodge City, Kansas Marshal, killed in the line of duty by cowboys on April 9, 1878. James “Jim” P. Masterson (1855–1895) – Brother to Bat Masterson, James was a lawman in Dodge City and Ingalls, Kansas. He later served as a U.S. Deputy Marshal in Indian Territory. He fought the Doolin Gang and was part of the posse that forced Arkansas Tom Jones to surrender. Robert Masterson, aka: Smiling Bob – Another brother of Bat Masterson, Robert was marshal in Trinidad, Colorado in 1882. He reportedly killed twenty-one men. William Bartholomew “Bat” Masterson (1856?-1921) – Ford County Kansas Deputy Sheriff and Sheriff, Trinidad, Colorado Marshal, Dodge City Peace Commissioner, U.S. Deputy Marshal In New York. Later a reporter for a newspaper. Died of natural causes in 1921. Jacob B. Matthews (18? ?-1904) – A gunman and lawman, he served in the Tennessee Cavalry in the Civil War and was later a deputy sheriff under Sheriff Brady during the Lincoln County War in New Mexico. D. Boone May (1852-1910) – A gunman, stage guard, and U.S. Deputy Marshal in Deadwood, South Dakota and Cheyenne, Wyoming, he killed several stage robbers in the 1870s. Thomas P. McCall – The first sheriff of Medina County, Texas in 1858. Later he served as a deputy sheriff in Bexar County, before becoming sheriff and serving for ten years. William McCauley – Served as a Texas Ranger in the 1890s and in 1897 helped break up a gang terrorizing San Saba, Texas. Robert McClure – Served as a Texas Ranger in the 1890s and in 1897 helped break up a gang terrorizing San Saba, Texas. Mike McCluskie, aka: Arthur Delaney, Art Donovan (18? ?-1871) – A little known gambler and occasional lawman, McCluskie was an Irishman from Ohio and a rough man by anyone’s standards. He made his way to Kansas by way of employment with the Santa Fe Railroad, as a Night Policeman. Earlier in the year of 1871, he had been charged with garroting a man to death in Newton, but the charges were dismissed. While in Newton, McCluskie befriended an 18 year-old man who was dying of tuberculosis. 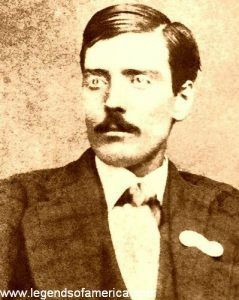 The young man, named James Riley, who was often called “McCluskie’s Shadow,” would play a major role in the famous Hide Park Gunfight. McCluskie primarily made his living as a gambler, but during the August elections, he was hired by the Newton authorities as a Special Policeman to help keep order. During the elections, he got into an argument with another Special Policeman by the name of Billy Bailey. The argument led to violence and McCluskie ended up killing Bailey. It was this event that instigated the Hide Park Gunfight, in which McCluskie was shot in the neck and back by Hugh Anderson during the gunfight. He died six hours later on August 19th, 1871. Myron McCord – Appointed as a U.S. Marshal in Arizona Territory on June 6, 1901. O.W. 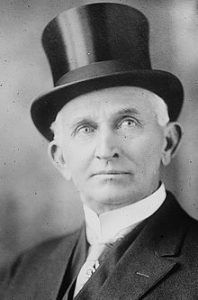 McCuiston – While sheriff of Raton, New Mexico in 1894, he became embroiled in a railway strike. William Jesse McDonald (1852-1918) – Deputy sheriff in Mineola, Texas; U.S. Deputy Marshal in Indian Territory; captain in the Texas Rangers. Died of pneumonia in 1918. James “Jim” McIntire (or McIntyre) (1846-1902) – A Texas gunman and lawman from 1860, he was a Texas Ranger, city marshal of Las Vegas, New Mexico, deputy sheriff, cowboy, hunter, gambler, and outlaw with a $1,000 reward on his head for the deaths of two men near Silver City, New Mexico. T.W. McIntosh – Served as a deputy marshal in Prescott, Arizona. Joseph “Joe” W. McKidrict (1871-1894) – Twenty-three year-old Texas Ranger, McKidrict was shot and killed by U.S. Deputy Marshal, Bass Outlaw on April 5, 1894 in El Paso, Texas. When the U.S. Marshal created a disturbance at Tillie Howard’s brothel and his gun accidentally went off, Constable John Selman and McKidrict quickly arrived. As the lawmen were trying to calm down the drunken Bass, he pointed his gun at McKidrict and shot him in the head and back, killing him instantly. Outlaw then fired at Selman, nearly striking him in the face and causing deep powder burns. Selman returned fire, hitting Outlaw just above the heart. As Bass staggered back he fired two more shots, hitting Selman above the right knee and in the thigh. Bass then staggered into the street where surrendered to Texas Ranger Frank McMahon. He died four hours later. McKidrict was buried in the Oakwood Cemetery in Austin, Texas. Joseph McKinney (18? ?-1850) – Having served only five months as Sheriff of Sacramento County, California, McKinney and his deputies were trying to arrest several squatters who had taken over land during the California Gold Rush. At this time, numerous confrontations were taking place between property owners and miners illegally occupying their property. On August 14, 1850, a city assessor was killed by squatters and the following day, Sheriff McKinney, along with 20 deputies rode to Brighton, California, where several squatters had barricaded themselves in a house. As the officers attempted to enter the house, gunfire erupted and when the smoke cleared, Sheriff McKinney and two squatters were killed. The other squatters were forced to surrender. Thomas L. “Tip” McKinney – A New Mexico gunman who was also a lawman, accompanied Pat Garrett when he killed Billy the Kid on July 14, 1881.